It’s 9:30pm and the children have finally been asleep for longer than 30 minutes. Or maybe it’s 9:30pm and you had to stay over at work for three hours too long, not seeing your partner since the evening before. You’ve had knock-back after knock-back lately – nothing seems to be making sense or improving. You’ve had that letter saying your job’s unsafe – try redundancy if you want. Only if you’ve been with the company long enough, though. You’ve had one too many arguments with your partner or best friend. The mother-in-law can’t help but get involved with every. Little. Decision. The weather’s making you miserable. Of course, there’s never not a time for self-care – maybe the simple act of a hot bath would have prevented some of your stress in the first place. But it’s mandatory, in my opinion, to take time out and focus on you, only you. If you’ve got someone to offer to watch the kids for an hour or two, take the offer. No ifs, no buts. If it’s 9:30pm and the only thing you want to do it hit the pillow, gift yourself that extra thirty minutes to focus on yourself. If you’ve got the time to sit here reading this, scrolling Facebook or Instagram, hide in the toilet, you’ve got time for self-care. Nurture yourself. We’ve all got different ways of relieving stress and troubles. Personally, I don’t use face masks as a relaxation technique because it’s a focus on my skin and my skin is troublesome. I use them to try and fix it. Rather, I like to practice mindfulness (loads of YouTube videos out there! ), move my body and focus my mind on scents. I’ve mentioned before that I’m super scent-driven. So, find what works for you! One scent I like to incorporate into my daily (and evening!) routine is lavender. I’m sure you’re all aware of its benefits for calming and well-being. 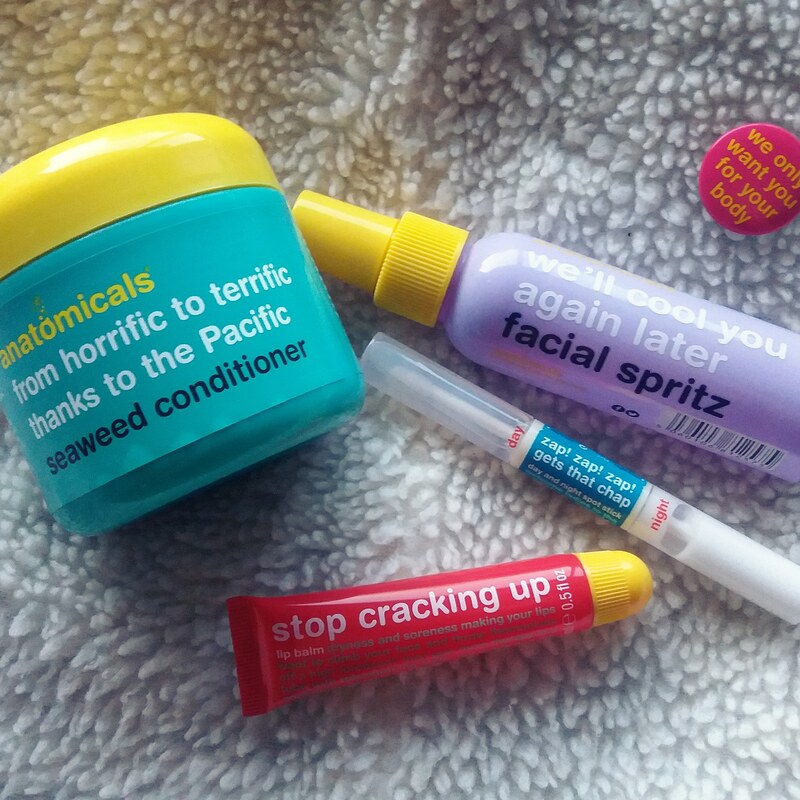 I love to use the Anatomicals ‘We’ll cool you again later’ facial spritz at any time I’m feeling low, hot and bothered, need energy for university assignments, or simply if I need a pick-me-up. It’s a sure-fire way to instantly make me feel better and refocus. The spritz contains refreshing lavender and peppermint extracts, as well as rose, aloe and witch hazel. I’m safe in the knowledge that it does great things for my skin without irritating it. Best of all, it’s literally a 2 second self-care step. AND it can be used on top of make-up. Or to dampen your beauty blender – this is game changing! Possibilities are endless. You can pick up your own skin-calming and hydrating spritz for just £6 from Superdrug or Fragrance Direct. I love to take care of my hair. It’s the one thing I can say I love about myself – it’s thick, healthy, un-dyed and in a good condition (considering I never get time to take it to the hairdressers!). I can’t wash my hair without conditioning – it feels so wrong if I do that. I like to have a gorgeous hair conditioner: although you could say it’s part of my routine and not a self-care step as such, it’s something I take time to think about. I can’t stand bad hair conditioners. The Anatomicals ‘from horrific to terrific thanks to the Pacific’ seaweed conditioner* has fast become one of my Holy Grail products, and one that I’ll wholeheartedly be purchasing once I’m finished with this one. Formulated with seaweed, it’s a deep conditioning and moisturising formula, which I find also removes dead hairs, leaving me with a gorgeous shine. Better yet – you guessed it – it smells incredible. Every time I open the tub and apply it, I’m overwhelmed by how amazing the scent is. Genuinely. It’s instantly relaxing and I feel like there’s a level of luxury to it. Like I’m doing something as simple as washing my hair, but that I’m treating myself. A bit on the pricey side compared to my usual conditioners – now at a reduced price of £6 at ASOS (I’ll be stocking up!) – however it’s taking a lot longer than I expected to get through the product. A little goes a long way! Now, I’ve mentioned my skin. If you’ve read my skin story, you’ll know how many different products I’ve tried in an attempt to cure my acne. Nothing works. Not even the product I’m about to share with you. However, it does work temporarily. This is the Anatomicals ‘zap! zap! zap! gets that chap’ night and day spot zapper*. It contains witch hazel and another of my favourite scents that transports me to tranquilty – tea tree. It contains a clear gel for day treatment and more of a creamy, moisturising gel for night spot treatment. I find the day gel starts to work instantly in comparison to the night treatment – you can literally feel it working into active spots. For me, it doesn’t ‘zap’ away the spot completely – what product does? – but the reddening is lessened, as well as the swelling I tend to get in my skin. It’s something I’d recommend as an on-the-go product if you’ve got nothing else to hand, as well as a pocket-sized self-care stick. For £3.50 from ASOS, you can’t really go wrong. I’ve saved one of the best until last: the Anatomicals ‘stop cracking up’ lip balm*. Another stunning, nutty, delicious scent that smells good enough to eat. As a lip balm, it’s a clear, almost watery consistency that instantly sees your lips soften. It’s not sticky in the slightest, which I love. My only niggle is that unlike Vaseline (which I’ve only recently learned is TERRIBLE for your lips! ), you need to apply this product every so often to ensure your lips stay moist. But that’s not really a complaint, as I love the smooth, sweet application of this. I could only find this as part of a duo as it’s sold out in it’s single form on the usual avenues! Grab this, and another – ‘never lose your cherry’ which sounds just as amazing – from Fragrance Direct for the fabulous price of £5 for the two! On top of all that, I love scented candles, my wax burner and snuggling my face into freshly-washed bedsheets. Sometimes it really is just the little things that can relax you, balance you, and provide your body, soul and mind with the self-care it needs. I hope you enjoyed this post – it’s a little different to standard product reviews, but as the kids get back to school for the winter term, nights grow darker, money becomes a little tighter and the Big Stress about Christmas rears its ugly head, I wanted to reiterate how important it is to take some time to focus on yourself. Even if it’s learning some simple yoga poses and focusing on your breathing, you’ll feel better for it. If unlike me, you’re sight, sound or taste motivated, take a walk through an autumnal wood, sit and listen to some birds, or shove your favourite treat into your mouth! *Anatomicals asked me to pick some products for free in exchange for a review. It’s not a paid partnership; by now you should know I’m completely honest and above all, passionate about the company, their approach to marketing and individuality as a brand. Thank you Anatomicals for allowing me this opportunity! None of their stuff is tested on animals, which is fabulous.